In the wake of the destruction of a worldwide non-nuclear war, the city Olympus has become the control center of the world. Run by Bioroids (cloned humans made from only the best DNA), it is defended from terrorists by special military forces. Among these are former LAPD SWAT member Deunan Knotts and her multipurpose cyborg partner Brialeos. They face a challenge from the Human Liberation Front and its terrorist underbelly the Argonauts. The leader of this group, Al Ceides, supposedly died 20 years ago in an attack on Poseidon, but now his shadow emerges once again. 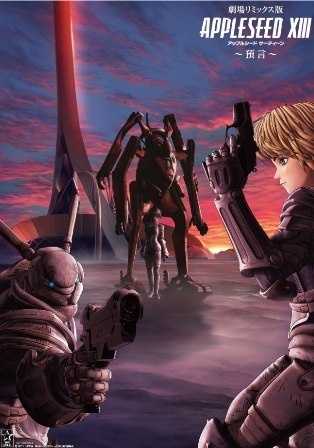 Watch Appleseed XIII Movie 2: Ouranos Episodes Online at Animegg.org. Appleseed XIII Movie 2: Ouranos is available in High Definition only through Animegg.org. Choose an episode below and start watching Appleseed XIII Movie 2: Ouranos in Subbed & Dubbed HD now.